What makes a landscape beautiful? What is it about the Hudson River painters that appeals so much? 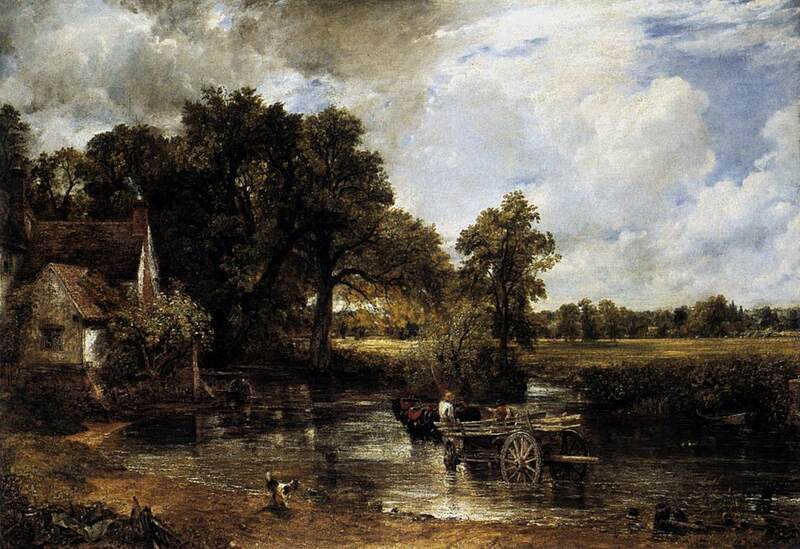 Why does Constable still speak to us, or Levitan or Brueghel for that matter? Of course, the fact that they are incredible painters helps. Our idea of what constitutes Beauty in humans has already been linked with Symmetry and The Golden Ratio. We find symmetry and proportion in the human face attractive on a gut level because they provide unconscious cues to the sexual health of a prospective mate. It's the old Greek ideal. 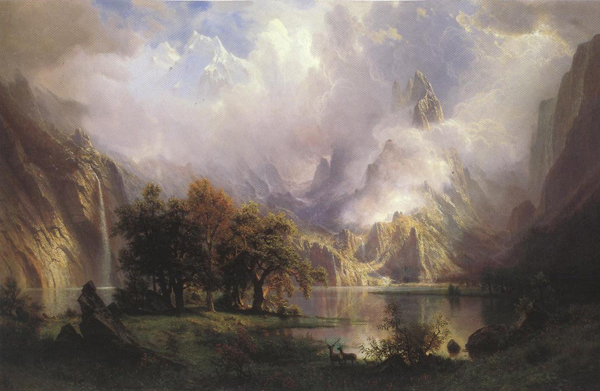 But what is Beauty in the natural landscape? In History of Beauty, Umberto Eco tried to persuade us that every historical era had its own ideas about beauty that are culturally based. From the middle of the Twentieth Century, art theorists tended to interpret art in terms of the historic and cultural context of its production; a kind of Nurture over Nature. Recently, however, a different idea has been revived: Could it be that we have a universal instinct that literally compels us to respond to certain elements in a landscape? "I know this sounds crazy, but ever since yesterday on the road, I've been seeing this shape. Shaving cream, pillows...Dammit! I know this. I know what this is! This means something. This is important!" 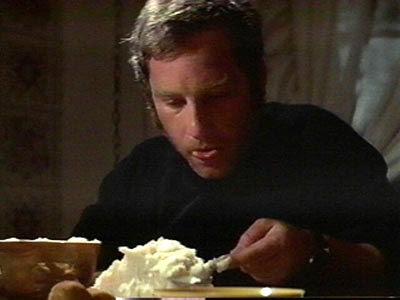 In Close Encounters of the Third Kind, Roy Neary finds himself compelled to form a mountain out of a plate of mashed potato thanks to a kind of implanted vision. It turns out that we too could be "sharing a common vision" like the people who showed up at Devil's Tower in Spielberg's classic movie. For hundreds of thousands of generations, proto-humans lived in the Pleistocene savannah. We learned to instantly recognize certain cues to the appropriateness for survival of one landscape over all others. Over time, goes the theory, nature selected those humans who could spot a suitable hunting ground or a good place to settle down for the night. Dutton says that "over tens of thousands of generations, such skills increased the status of those who displayed them and gained a reproductive advantage over the less capable." Our mental capacities, inclinations, and desires were definitively shaped in those millions of years. These features were fully developed since the last 10,000 years, when human beings developed agriculture and cities, metal tools and writing. Our brains have changed little, if at all, since then [all the more remarkable when you consider our capacity to understand Physics, or the era of the Computer, for example]. 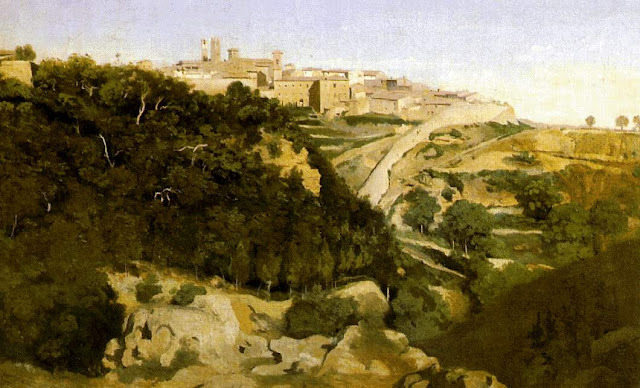 We've only been tied to this modern era of cities for a blip on the cosmic timescale, and our brains are still very much mired in Stone-Age notions of what constitutes a 'beautiful landscape'. Whether we consider the human eye, our upright walk, or our appreciation of landscape, they are each informed by natural selection working on the evolution of our simian brains. • A pathway, or trail. Landscapes that aid and encourage exploration are preferred over landscapes that hinder these needs. We like easy access, but also we like to know that we can escape back up that track if we need to. A hint of interesting features that could be discovered. 'Uncertainty' is a key element in our everyday lives. Complete certainty in everything is the death of the spirit. In landscapes, we like our trails to lead around a bend, enticing us to explore. 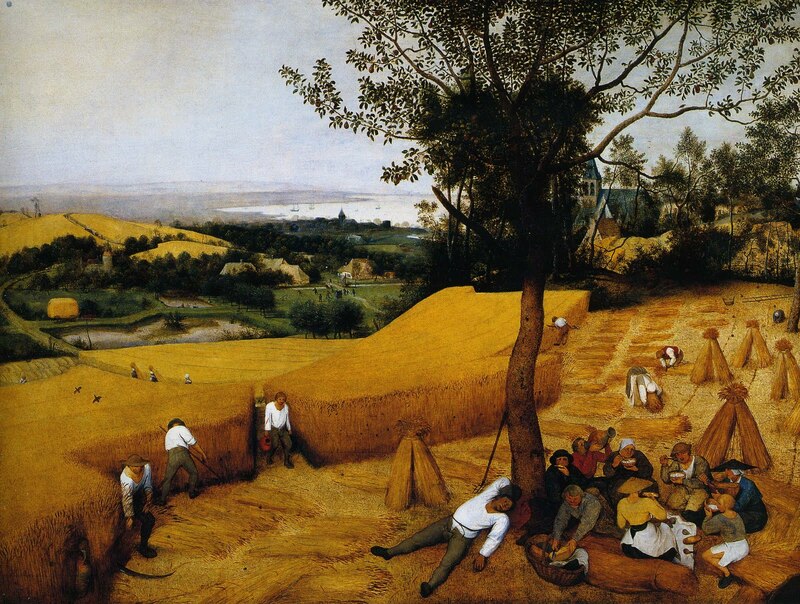 The landscape needs to be complex, but not so complex as to be 'unreadable.' 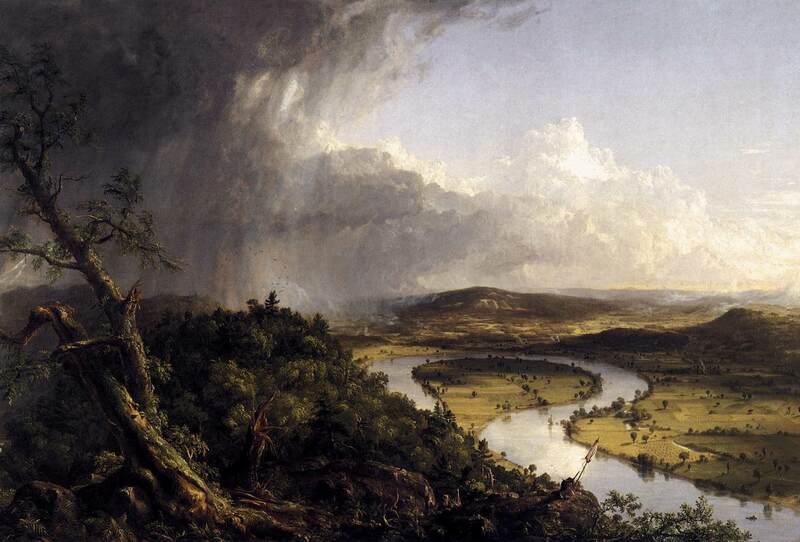 We show highest preference for landscapes at the middling level of complexity. Just as 'uncertainty' is important, so too (paradoxically) is 'certainty'. We want to feel safe from threat or harm. We like to see trees branching close to the ground, which provide a quick means of escape should we need to dash up one to escape a predator. We have also been shown to prefer copses, or intermittent tree coverage, in our landscapes. It's easier to track and hunt if you have space to run. Our ancestors ran for hours after their quarry, literally exhausting them until they could flee no more, and simply dropped in their tracks. Like the savannah from which we came, we prefer some undulations in our landscapes. They tell us that the land will be dry enough to camp on, and that the hills will also provide a good vantage point for safety or hunting, and multiple escape routes. It also ties in with our preference for mystery: stimulating the imagination and the desire to know "what's over the hill". We consistently show a preference for nature over, say, a cityscape. Studies generally leave animals out of test photographs because they skew preference scores - it is known that we overwhelmingly prefer the presence of animals. After all; a man's got to eat. 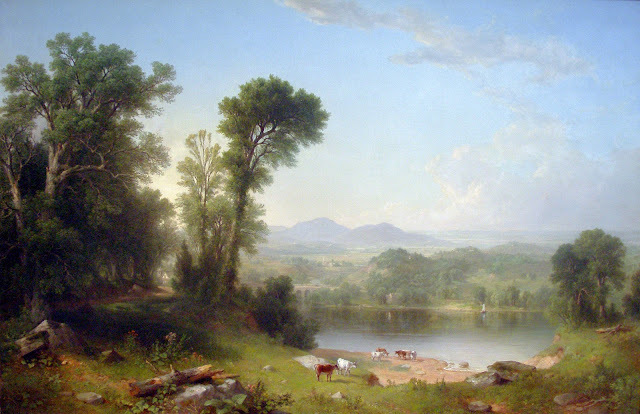 Notice those cattle in the Asher Durand painting? Of course you did; It was the first thing you saw. We like to see a border or edge that can be followed for some miles. It breaks the landscape into large chunks for us, making it easier to make quick assessments about lurking threats or dangers, and the potential resources available. Wouldn't want to get lost if a mist or dust-storm rolls in. A mix of wet and dry land implying distinct and reliable seasons, and of course, a reliable source of drinking water (for us, and for our prey). Look again at the examples of paintings I've shown here. Some, or all, of the elements I've mentioned as essential are present in each of them. the mysterious natural laws that will be forever obscured from us." "We predicted that subjects who reported positive moods (e.g., cheerful, energetic, optimistic) would be motivated to explore, and thus, would prefer landscapes rich in “Prospect” (vast expanses and overviews), while subjects who experienced mood dysphoria (e.g., tense, depressed, fatigued) would be motivated to reduce stress, and thus, prefer landscapes rich in “Refuge” (enclosed, protected spaces). 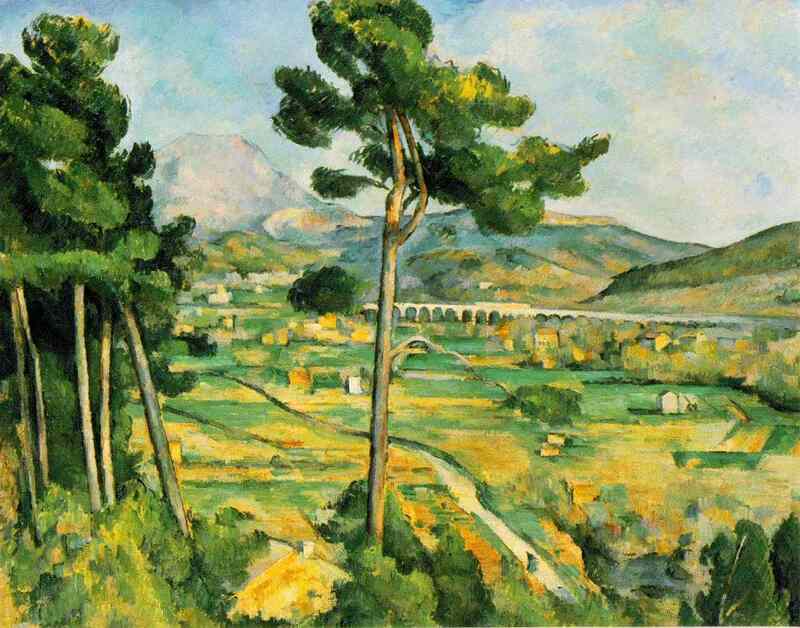 While not all of the predictions were confirmed, in general, landscape preferences were found to relate to mood in the manner predicted." So, while the Romantics like Byron and Shelley might have enjoyed the epic mystery of a Bierstadt or Friedrich landscape, the Intellectuals (or Realists/Rationalists - whatever you want to label them) among us prefer to gaze out a window at an English rose garden with a gazebo. They may seem different, but both concepts of what constitutes beauty in nature are defined by the same imperatives. 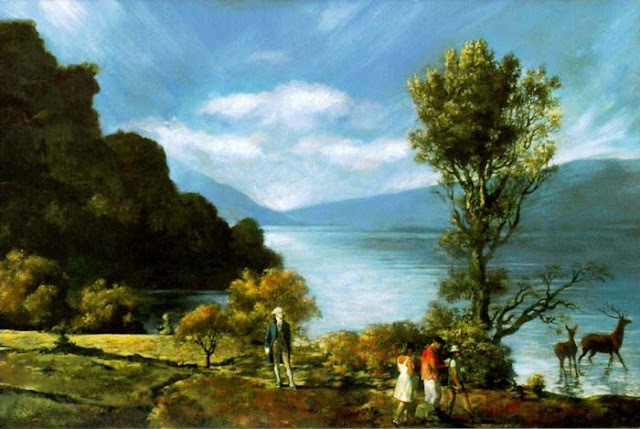 The Romantics simply are giving precedence to the notion that a landscape must contain mystery (or "Prospect"), while the 'intellectuals' respond positively to nature when they feel secure from threat ("Refuge"). Is as much my body as what you see before you here. I cannot be separated from this or from you. Our many hearts have only a single beat." Perhaps, like hamsters running tirelessly on a treadmill, we are gripped by a distant memory of our ancestral homeland when we stop in front of a vista and exclaim "wow, now that's beautiful." Komar and Melamid are two Russian artist emigrés who undertook a fascinating project. 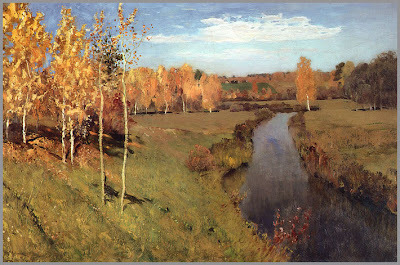 Their book, Painting by Numbers, explains that "with the help of The Nation Institute and a professional polling team, they discovered that what Americans want in art, regardless of class, race, or gender, is exactly what the art world disdains--a tranquil, realistic, blue landscape." Once they received the general consensus, they painted the result. The painting above is what Americans prefer to see, complete with a historic figure (George Washington), deer, and children. It's an ugly amalgamation for sure, but it is quite revealing of the aesthetic preferences of the general populace. One thing that immediately strikes me is that it looks absolutely nothing like what the Art World tells us is 'good art.' Although, I do suspect (like Arthur Danto) that most people would rather not actually hang this on their wall. I know I wouldn't like to. Not content to stop there, the duo polled countries from all over the World. The results are in (and not a surprise): People the world over tend to prefer a strikingly similar landscape. The elements we have laid out earlier are all there. What does this tell us about aesthetics and human evolution? The argument has been made that the results are an aberration due to the ubiquity of Hallmark calendars in all the countries polled - that the results have been skewed. I like to think that the ubiquity of Hallmark calendars is exactly the proof we're looking for: Hallmark is everywhere precisely because that's what we prefer to look at. Komar and Melamid have just laid out Hallmark's market research for them, and Evolutionary Psychology has backed it up: The experience of beauty belongs to our evolved human psychology. One thing I find especially interesting about this posting is that, whereas I think of cloud formations as horizontal structures, I see that the majority of your choices have clouds that arc upward. I love them all. Ha! Yeah it's true: I'd have to side with the Romantics on that one. Maybe I like my landscapes with a hint of mystery. That weather could break at any moment! This is a fantastic post Alan. Speaking of clouds, how about an post on cloud painting? I've seen you create some amazing clouds and I know it'd be a hit with your readers and very applicable to many decorative solutions. PS. I think it was Spielberg who directed Close Encounters. It was a good year for movies. Star Wars came out then too. Maybe that's how I got confused. Wait, it was the same year wasn't it? I cannot imagine a landscape without these many elements...not in a painting..for some reason most of them shown a large number of things that together just do the perfect Ensamble , I would be shortly tired to look at a panorama with sky and clouds or just a big green extension and one tree maybe my fantasy will work better but not my eyes...what do you think ? What an interesting and informative post! Excellent blog very nice and unique post,I love this,thank you so much for sharing such a wonderful post.